The website involved was set up by Jason Velazquez, a marketing director based in Atlanta, Georgia, who bought the rights to use the domain for one year. 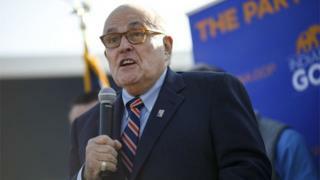 “When I noticed the accidental link on Giuliani’s tweet, I clicked on it,” he told the BBC. “I quickly upload my files, tweeted about what I had done, and left my apartment. Love that the link still lives on and that the owner of the domain is from Georgia. It’s Jeff Sessions!